Elastic Beanstalk provides several options that control the security of your environment and of the Amazon EC2 instances in it. This topic discusses the configuration of these options. You can modify your Elastic Beanstalk environment security configuration in the Elastic Beanstalk console. On the Security configuration card, choose Modify. Select a service role to associate with your Elastic Beanstalk environment. Elastic Beanstalk assumes the service role when it accesses other AWS services on your behalf. For details, see Managing Elastic Beanstalk Service Roles. You can securely log in to the Amazon Elastic Compute Cloud (Amazon EC2) instances provisioned for your Elastic Beanstalk application with an Amazon EC2 key pair. For instructions on creating a key pair, see Creating a Key Pair Using Amazon EC2 in the Amazon EC2 User Guide for Linux Instances. When you create a key pair, Amazon EC2 stores a copy of your public key. If you no longer need to use it to connect to any environment instances, you can delete it from Amazon EC2. For details, see Deleting Your Key Pair in the Amazon EC2 User Guide for Linux Instances. Choose an EC2 key pair from the drop-down menu to assign it to your environment's instances. When you assign a key pair, the public key is stored on the instance to authenticate the private key, which you store locally. The private key is never stored on AWS. For more information about connecting to Amazon EC2 instances, see Connect to Your Instance and Connecting to Linux/UNIX Instances from Windows using PuTTY in the Amazon EC2 User Guide for Linux Instances. An instance profile is an IAM role that is applied to instances launched in your Elastic Beanstalk environment. Amazon EC2 instances assume the instance profile role to sign requests to AWS and access APIs, for example, to upload logs to Amazon S3. 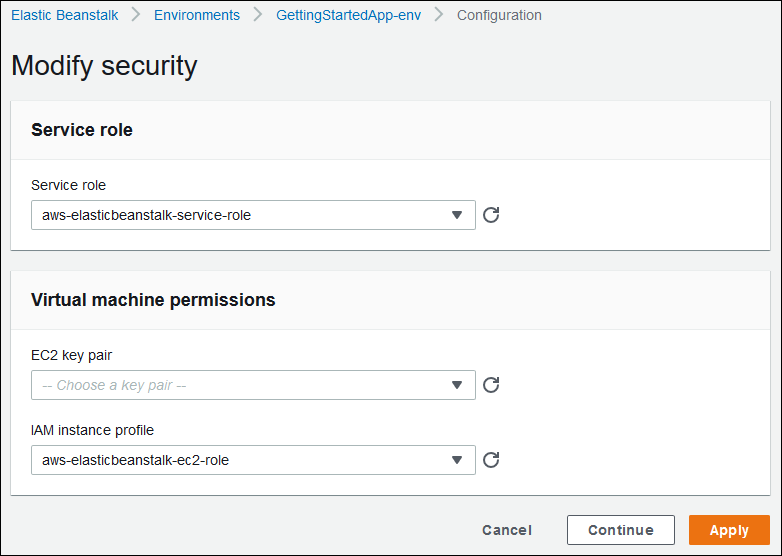 The first time you create an environment in the Elastic Beanstalk console, Elastic Beanstalk prompts you to create an instance profile with a default set of permissions. You can add permissions to this profile to provide your instances access to other AWS services. For details, see Managing Elastic Beanstalk Instance Profiles. aws:elasticbeanstalk:environment – Configure the environment's service role using the ServiceRole option. aws:autoscaling:launchconfiguration – Configure permissions for the environment's Amazon EC2 instances using the EC2KeyName and IamInstanceProfile options.